For some strange reason, people don’t seem to be taking my last post very seriously. Does everyone think it’s a joke or something? Weird. Well, if you guys feel so strongly about it that you’ll keep yourselves in denial like this, I guess I’ll play along. MEGA thanks to Amie, Bryn, Katie, and Sarah for all the cat pics! By the way, the waiting list is growing longer so don’t put off submitting your pets to be MEGAFIED! You’ll be mildly amused that you did. Regular Lavatory activities should resume this afternoon! 5 Comments to "Back In Action!" In other words: Yes, it was all a gag, hope it wasn’t the worst one you’d seen this year. 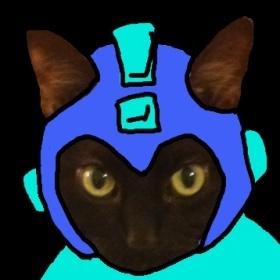 I’m still having fun with Mega Catz so I’ll probably see how far I can run with it before I get bored. Also, I still don’t have today’s content up because I keep getting distracted!